Over sixty future Tulalip leaders participated in the first week of the 22nd Annual Lushootseed Language Camp. 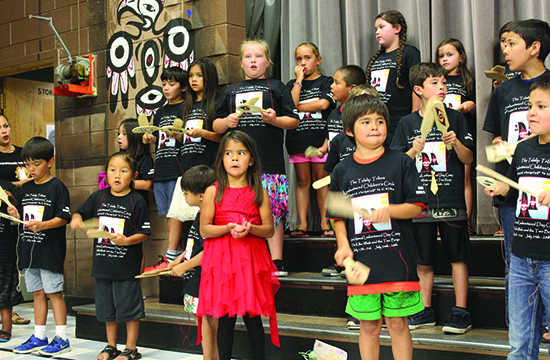 The kids learned the traditional Coast Salish language and Tulalip culture during the week of July 17-21. 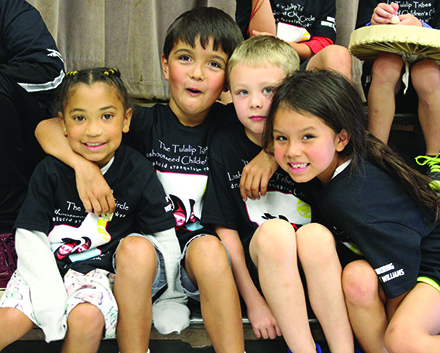 Hosted by the Tulalip Lushootseed Language Department, the summertime camp is held twice during the month of July and is open to Tulalip youth age five to twelve. The kids are treated to five fun days of culture in which they learn the traditional language, teachings and stories of Tulalip. The camp utilizes several interactive activity stations to teach about Tulalip’s traditional way of life. 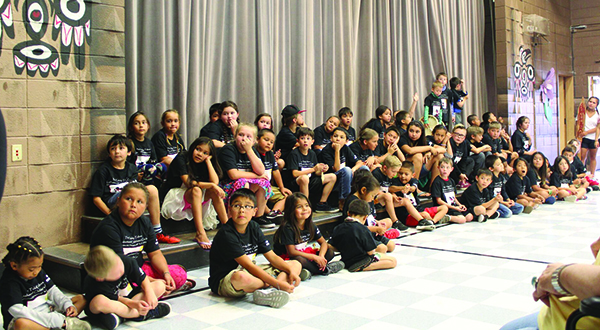 Campers become familiar with the words while playing games and using modern technology. 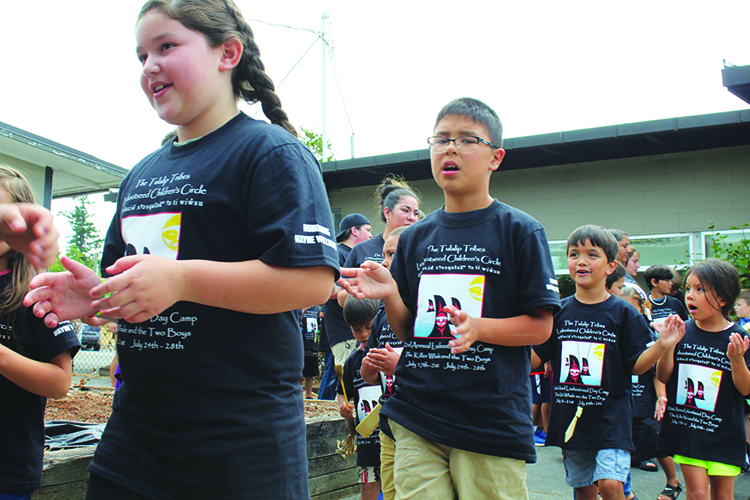 In addition to studying Lushootseed, campers also learn traditional Tulalip dances and songs. Each year, the Lushootseed Department honors a Tulalip member by teaching the youth about their work within the Tulalip culture. Last year the camp was dedicated to Harriett Shelton-Dover, this year the camp is dedicated to her son and Tulalip Elder, Wayne Williams. Throughout the week, the youth rehearse a play based on a traditional Tulalip story. The play is performed for the community during the closing ceremony on the last day of camp. 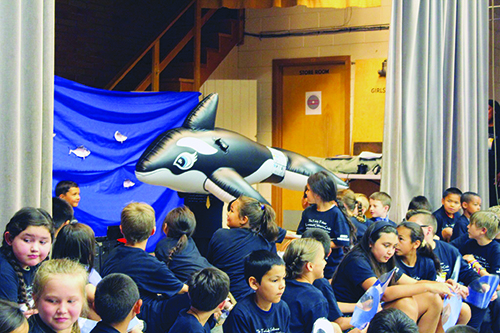 In honor of Wayne Williams, the Language Campers reenacted Wayne’s story Killer Whale and Two Boys. Language Camp continues to grow; previously the department would anticipate about fifty participants each summer. However, due to increasing interest, the camp has seen an increase of fourteen participants each week in the past two years. Young Tulalip tribal members and siblings, Natalie and Carsten Nordahl, travel from Boston every summer to attend Language Camp. According to their father, Natalie excitedly awaited the year her younger brother was old enough to enroll, in order to experience the cultural camp together. The kids have returned each summer, making this their third trip to Tulalip. 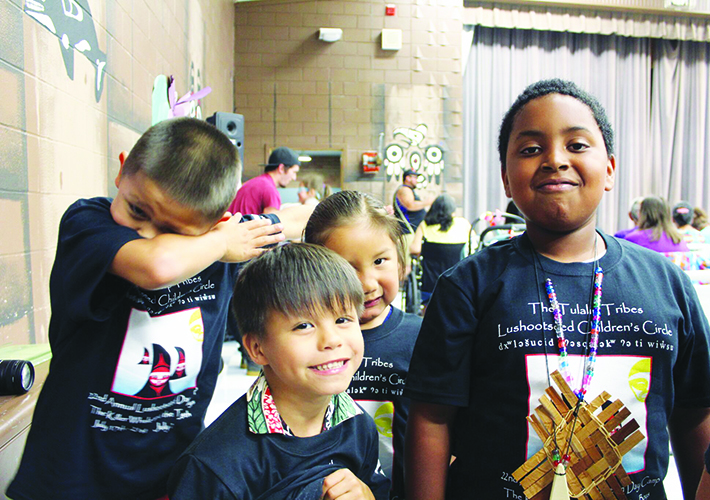 Parents, grandparents, aunties and uncles gathered at the Betty J. Taylor Early Learning Academy Gym on July 21, for the 22nd Annual Lushootseed Language Camp closing ceremony. The youth showcased their teachings to the community by performing the songs and the play in Lushootseed. “As a parent it’s important for my son to attend language camp because it was something I was able to do as a child and it’s important to carry on the songs and the teachings from our ancestors,” states Lushootseed Camp parent and Tulalip tribal member Samantha Chavez. After performing Killer Whale and Two Boys, the youth gave handmade gifts, such as weavings and necklaces, to every guest in attendance. 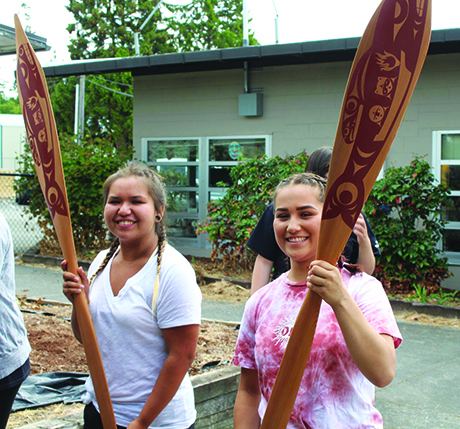 Over the span of twenty-two years, the camp has inspired numerous Tulalip youth to learn more about their culture. Many current Lushootseed Language Instructors, attended Language Camp when they were younger, including Tulalip tribal member Shelbi Hatch. 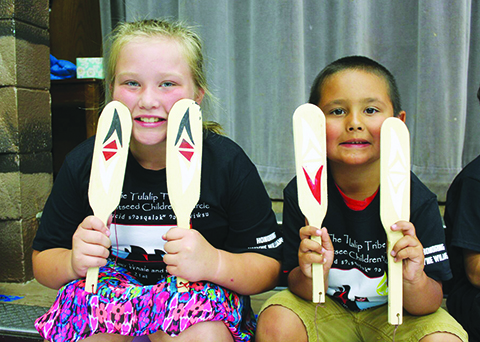 The Lushootseed department and the language campers displayed two paddles, with traditional artwork depicting the Killer Whale and Two Boys story that will be gifted to Wayne Williams and his sons. 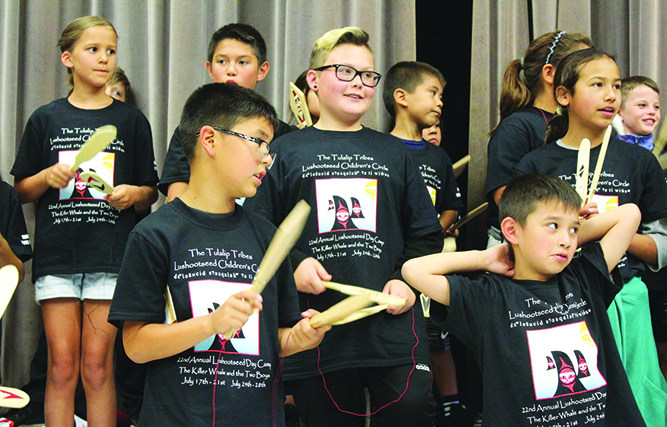 This entry was posted in Education, News, Tulalip News and tagged coast salish, language, Language camp, Lushootseed, Tulalip, Tulalip Tribes by Kim Kalliber. Bookmark the permalink.